Two things stand out for me about Postwar, by Tony Judt. First, it is a stupendous historical synthesis that aims to tell a mostly political history of all of Europe — East and West, North and South — from 1945 through its publication in 2005. Second, I should have been writing reflections about it as I went along, or at least written soon after finishing the book. 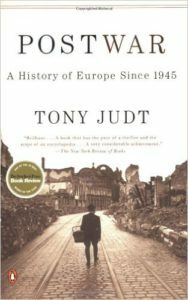 In his Preface, Judt gives one of the reasons I found Postwar such fun to read: “Without, I hope, abandoning objectivity and fairness, Postwar offers an avowedly personal interpretation of the recent European past. In a word that has acquired undeservedly pejorative connotations, it is opinionated. Some of its judgments will perhaps be controversial, some will surely prove mistaken.” (p. XIII) I learned from Judt, especially concerning the early years, concerning France, and concerning political and social developments that were internal to the left side of the spectrum. But I also argued with Judt, thinking that he was off here or there, that this particular thread was overlooked, or that matter should have been put a bit differently because it pointed to this or drew on that. I, too, am opinionated, and I enjoyed testing my opinions against Judt’s to see where they aligned, where they differed, and why. In lieu of a more formal review or systematic consideration of the text, here are some of the things that particularly caught my interest. I admire the pithy summary, especially “not to be trusted together.” American (and presumably also British, though I know it less well) exasperation with French political choices can easily result from either not knowing this about the French, or not appreciating it sufficiently. On the other hand, I wonder how much French policy makers realize that something similar applies to Poland. “Nothing about us without us” is one of the key ideas of Polish policy, particularly in European and NATO circles. And while I am given to understand that the “Weimar Triangle” of Poland, France and Germany functions well, it does not have the same heft of the Franco-German tandem. Within the EU, France does nearly precisely what it resents the US and UK doing at a more global level. I wonder whether they see it. But it also meant that most British voters (and many British Members of Parliament) had absolutely no idea of how poor their country was and what it had cost them to win their epic struggle with Germany. Brexit in four paragraphs. At the very least, a quick primer in Britain’s difficult relationship with European institutions. Part of this is the long-standing question of Britain holding itself separate from the continent, another part is the different experience of Britain as a country that had not been defeated at any stage during the war. All of the ECSC’s founding members had either been overrun by the Axis or surrendered unconditionally to the Allies. As Judt notes, though, the fact of victory obscured to many in Britain the extent of its costs. Wartime rationing lasted well into the 1950s; part of the initial allure of Ian Fleming’s James Bond character was his access to the high life, a life that from the perspective of an ordinary citizen of the early 21st century looks distinctly limited. Why did it seem to matter so much that Britain stood apart? Despite the diminished state of the postwar UK, Britain was still one of Europe’s most important countries. London was one of the continent’s greatest cities, a center of global networks whose only competition in Western Europe was Paris. Without Britain, Europe was (and will be) incomplete. In the early years, with Communism in the East, dictatorships in Iberia, and neutrality elsewhere, the free countries of Western Europe were fewer, and Britain’s absence from continental projects was even more noticeable. This phrase — “the lowest common denominator of West European mutual interest at the time of its signing” — is also interesting. The level of integration has obviously increased during the intervening decades, but there’s a good argument to be made that because EU processes are driven by the member states, it still holds true. Qualified majority voting is one way to get around absolute lowest common denominators, mostly because states (or more precisely, their leaders) recognize that they will on the whole gain more from occasionally losing a vote than they would from insisting on unanimity for every issue. Current friction within the EU over Hungary and Poland, to say nothing of Brexit, show that the common denominator can be pushed downward if member governments are determined to do so. Judt’s descriptions quoted here show that many of the tensions within European institutions have been there at least from the beginning. Without even pretending to demur, De Gaulle took office on June 1  and was voted full powers by the National Assembly the following day. His first act was to fly to Algiers, where on June 4th he announced delphically to an enthusiastic crowd of cheering soldiers and grateful Europeans: “Je vous ai compris” (“I have understood you”). The new French Prime Minister had indeed understood his Algerian supporters, better than they knew. He was immensely popular among the Europeans of Algeria … But among De Gaulle’s many distinctive traits was an unwavering appreciation for order and legitimacy. The hero of the Free French, the implacable critic of Vichy, the man who had restored the credibility of the French state after August 1944 as no friend of the Algerian rebels (many of them former Pétainists), much less the free-thinking insurrectionary young officers who had taken their part. His first task, as he understood it, was to restore the authority of government in France. His second and related objective was to resolve the Algerian conflict that had so dramatically undermined it. Judt is very good in writing about France. This passage struck me for the economy of its reintroduction of De Gaulle and the dynamic between would-be putschists who thought the general would take up their cause and the general who understood very well what he was being asked to do, and dropped some reality instead. Half a century later, and from the outside, it’s easy to underestimate the effects of Algeria on France. Judt shows readers that that would be a mistake. The accounts of De Gaulle’s return and the Hungarian revolution are both in a chapter titled “Lost Illusions.” Judt would count himself among “non-Communist intellectuals of the Left,” although the illusions shattered by Hungary (however many were left after the 1953 uprising in East Berlin) are mostly those of people slightly older than Judt. This passage shows not only how Postwar engages both Eastern and Western Europe but also how the Iron Curtain was permeable, even in the 1950s. It further touches on what attracted people in Western Europe to alternatives to the systems that they knew. Judt is also good at chronicling the importance of Communist parties in the West, and how they differed among one another — particularly the contrast between Italy and France, both of whose parties enjoyed significant membership and voting power — as well as their complex relations with Moscow. This is the kind of work that only a large synthesis can do, and Judt does it very well. Nevertheless, every European country saw steadily growing rates of per capita GDP and GNP … In the course of the 1950s, the average annual rate at which per capita national output grew in West Germany was 6.5 percent; in Italy 5.3 percent; in France 3.5 percent. The significance of such high and sustained growth rates is bet appreciated when they are compared with the same countries’ performance in earlier decades: in the years 1913–1950 the German growth rate per annum was just 0.4 percent, the Italian 0.6 percent, the French 0.7 percent. Even in the prosperous decades of the Wilheminian Empire after 1870, the German economy had only managed an annual average of 1.8 percent. Western Europe grew wealthy. Further, thanks to strong unions and public policy the benefits of that wealth were widely shared within the population. It’s nearly impossible to overstate how much difference these two facts made to life in Europe, and to the trajectory of European politics. Not only did Europe’s western half get richer, population growth returned. My marginal note next to the paragraph on milk is simply, ! A baby boom, Judt’s own generation, plus rising prosperity transformed Western Europe. Those changes also drew in labor from Iberia, particularly to France, and created the need for guest workers in West Germany, setting the stage for long-term changes in that country’s demographics as well. Refrigerators, washing machines, automobiles, recreational travel, leisure spending of almost every sort; in short, consumer culture and a great deal of what is considered the European way of life all arrived in the immediate postwar decades, borne on a tide of increasing populations and rising prosperity for nearly all. With the possible exception of youthfulness, what “America” is in this passage, “Europe” was for Central and Eastern Europeans after 1989. I had not known this. Proof again, if such were needed, that it pays to examine all of the figures behind the assumptions. I can’t speak to London or Paris, but the Anhalter was built for a railroad network that did not exist in postwar Berlin, and the real work of destruction was accomplished by the war, not by any iconoclasts who came afterward. It’s hard to fault reconstruction in West Berlin for not recreating a terminal to serve lines that no longer ran, for an empire that no longer existed. When I saw the remains of the Anhalter in 1989, all that was left were part of its front facade and several of the hanging arches that would have supported the roofs over the tracks. They were eloquent testimony to the destruction the war had wrought. Since then, the space has been reclaimed as a public park, with a fantastical performance arena where the trains once entered the station, and the portion of the front facade retained as a monument. So much in one paragraph! I have no idea how Forefathers’ Eve got past the censors. They would surely have known its history, and its implications in a society under censorship and with a government eventually answerable to authorities in Moscow, just as in Mickiewicz’s day. It’s possible that local authorities were in agreement with the students, or that they thought it would let off a little steam but then got out of hand. Both of those were occasional courses of events under Communism. It’s possible that the decision was just a gross error; it would certainly not be the grossest in Communist Poland. Theater has a long subversive tradition in Poland, and this particular action extended it. The authorities’ relaxation, however limited or temporary, allowed creativity in related areas as well; Polish theater posters became known for innovative design and sometimes anti-authority content. I have a memorable one from a production of King Lear. Adam Michnik bounced out of Warsaw University and eventually landed in dissident circles on the intellectual side of the alliance that would bring down Communism two decades later. The newspaper he founded, Gazeta Wyborcza, is now Poland’s most important, and Michnik himself is a major figure in Polish media and politics. Just so. Milosevic died after the publication of Postwar. At the time of his death, he was standing trial for genocide and crimes against humanity. Judt’s last two chapters, “The Varieties of Europe” and “Europe as a Way of Life” (the puckish science fiction fan in me would have enjoyed a counterpoint chapter, “Europe is Just a Goddamn Hobby”), consider what constitutes Europe in the early 21st century. It’s a fascinating examination of borders, values, peoples, historical experiences and more. I certainly didn’t agree with all of it, but I found it productive to argue with and against. I lived in one of those peripheral countries for several years in the period after Postwar‘s publication, and the benefits of increasing inclusion were neither flimsy nor forlorn. They were measurable in roads paved, in air connections that brought steady streams of visitors, in police stations built, and much more. Europe, for all of its problems and challenges, retains its attractiveness. Postwar, whose surface I have barely begun to scratch here, is a terrific guide to why.